Copernicium atoms have 112 electrons and the shell structure is 2.8.18.32.32.18.2. The ground state electronic configuration of neutral copernicium is [Rn].5f14.6d10.7s2 (a guess based upon that of mercury) and the term symbol of copernicium is 1S0 (a guess based upon guessed electronic structure). Copernicium: description Your user agent does not support the HTML5 Audio element. Copernicium was discovered on 9th February 1996 at 22:37 at the GSI in Darmstadt, Germany. The interested reader should consult the on-line version of Creating Super Heavy Elements for a fascinating insight into research on "super-heavy" atoms. In honour of scientist and astronomer Nicolaus Copernicus (1473-1543), the discovering team around Professor Sigurd Hofmann suggested the name copernicium with the element symbol Cn (the original proposal was Cp) for the new element 112, discovered at the GSI Helmholtzzentrum für Schwerionenforschung (Center for Heavy Ion Research) in Darmstadt. It was Copernicus who discovered that the Earth orbits the Sun, thus paving the way for our modern view of the world. Thirteen years ago, element 112 was discovered by an international team of scientists at the GSI accelerator facility. A few weeks ago, the International Union of Pure and Applied Chemistry, IUPAC, officially confirmed their discovery. In around six months, IUPAC will officially endorse the new element's name. This period is set to allow the scientific community to discuss the suggested name copernicium before the IUPAC naming. 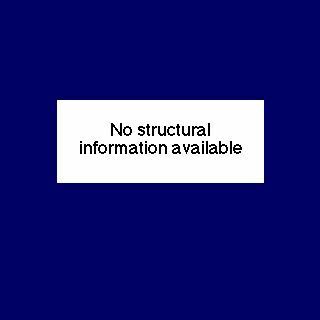 The solid state structure of copernicium is: bcc (body-centred cubic). Element 112 (provisionally named copernicium, Cn) has no biological role. Reactions of copernicium as the element with air, water, halogens, acids, and bases where known. Binary compounds with halogens (known as halides), oxygen (known as oxides), hydrogen (known as hydrides), and other compounds of copernicium where known. Bond strengths; lattice energies of copernicium halides, hydrides, oxides (where known); and reduction potentials where known. Copernicium was discovered by S. Hofmann, V. Ninov, F. P. Hessberger, P. Armbruster, H. Folger, G. Münzenberg, and others in 1996 at Gesellschaft für Schwerionenforschung (GSI) in Darmstadt, Germany.. Origin of name: the temporary systematic IUPAC nomenclature is ununbium but the discoverors have now suggested the name copernicium.. 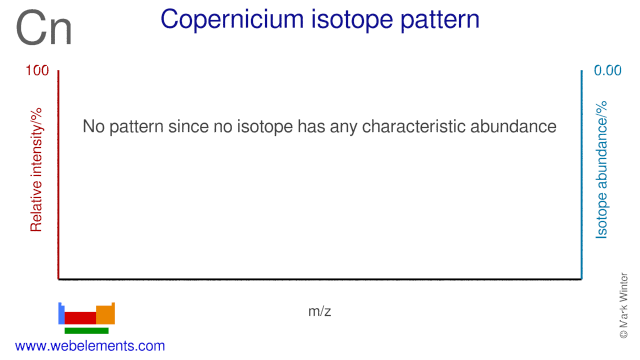 Isotope abundances of copernicium with the most intense signal set to 100%. Isolation: as only a few atoms of element 112 (provisionally named copernicium, Cn) have ever been made (through a nuclear reaction involving fusing a zinc atom with a lead atom) isolation of an observable quantity has never been achieved, and may well never be. 208Pb + 70Zn → 277Cn + 1n This is because atoms of the element decompose through the emission of α-particles with a half life of only about 240 microseconds. Abstract (http://www.gsi.de/forschung/kp/kp2/ship/public/sn112-abstract.html ): The new element 112 (provisionally named copernicium, Cn) was produced and identified unambiguously in an experiment at SHIP, GSI Darmstadt. Two decay chains of the isotope 277-112 were observed in irradiations of 208-Pb targets with 70-Zn projectiles of 343.8 MeV kinetic energy. The isotope decays by emission of alpha particles with a half-life of (240 +430 -90) micro seconds. Two different alpha-energies of (11,649+-20)keV and (11,454+-20) keV) were measured for the decaying nuclei. The cross section measured in three weeks of irradiation is (1.0 +1.3 -0.6) pb.